A combined clinical assessment and decision-making flowchart to assist health and medical practitioners to quickly identify the best treatment response for individuals who are using methamphetamine and other psychostimulants. 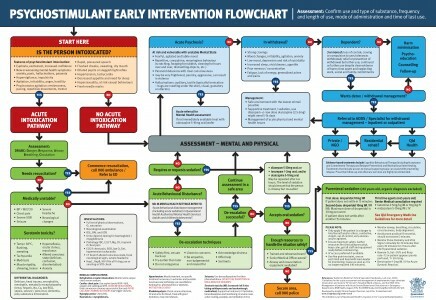 Learn more about the Combined psychostimulant medical early intervention flowchart below. An initiative of Queensland Health, proudly delivered by Metro North Mental Health – Alcohol and Drug Service. Insight acknowledges the Traditional Owners of the lands throughout Australia, paying respects to their Elders past, present and emerging.